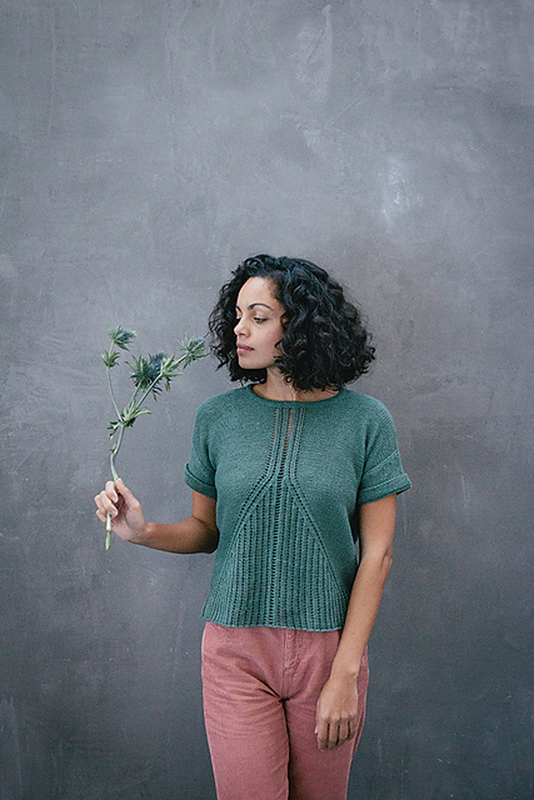 Taken from: Pom Pom Quarterly - Issue 28 - Spring 2019 "Ginkgophyte" - Botanically-inspired, Ginkgophyte is the perfect addition to your warm weather wardrobe! 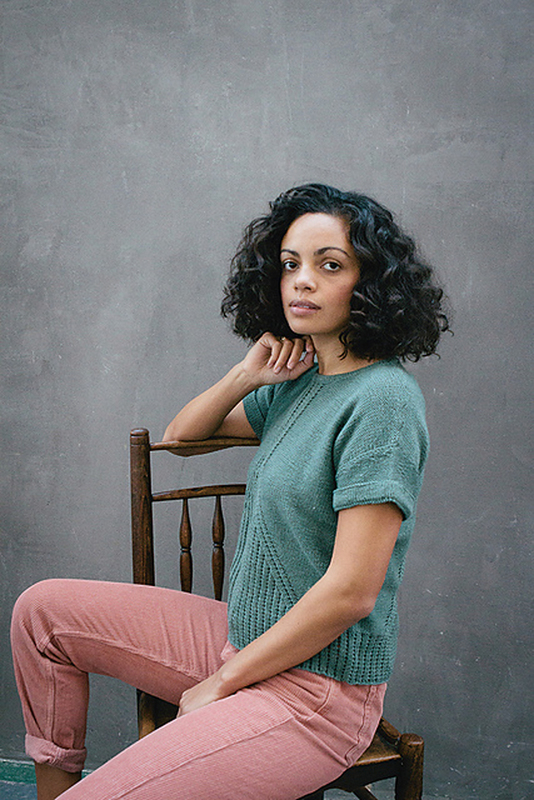 Knit in a wool/silk blend, it has just the right amount of structure and drape. 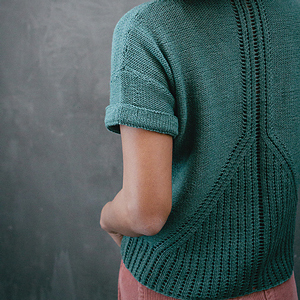 Fun detailing along the front and back of the tee will keep things interesting, until the last stitch! Size US 1 - 16" and US 2.5 - 32" circular needles (or size needed to obtain gauge) are required but not included. Notions required but not included: 3 stitch markers (using locking or removable stitch markers is helpful) and tapestry needle. Gauge: 22 sts & 34 rows = 10cm / 4". 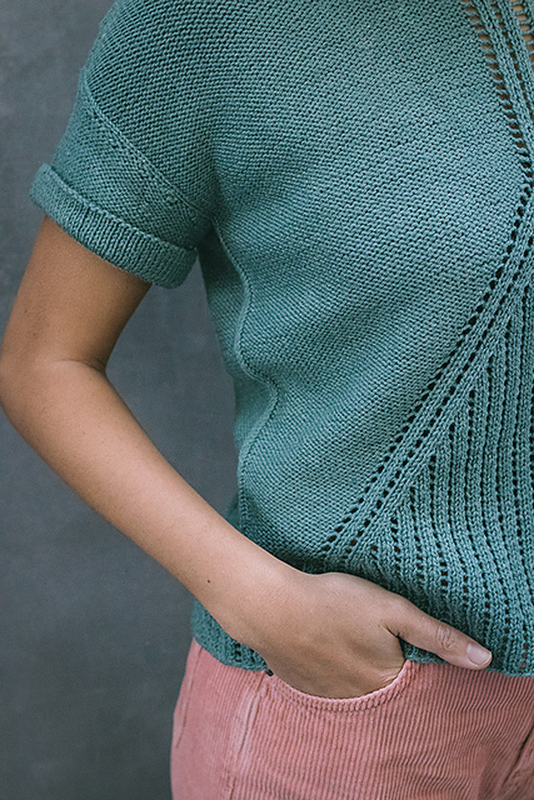 Yarn Shown: Quince & Co. Tern, which we do not currently carry. We recommend using Shibui Staccato as a substitute. $98.50 -- Kit price including yarn and pattern book. $96.00 -- Kit price including yarn only (no book or pattern). $114.50 -- Kit price including yarn and pattern book. Bust Size 45", 49 1/2"
$112.00 -- Kit price including yarn only (no book or pattern). $130.50 -- Kit price including yarn and pattern book. Bust Size 53 3/4", 58 1/4"
$144.00 -- Kit price including yarn only (no book or pattern). $162.50 -- Kit price including yarn and pattern book. $160.00 -- Kit price including yarn only (no book or pattern). $178.50 -- Kit price including yarn and pattern book.